GAC Motor, a leading Chinese automobile brand developed by Guangzhou Automobile Group, is getting ready for entry into the Russian market. The carmaker made its debut at the 2019 St. Petersburg International Motor Show with the aim of meeting the driving demands of Russian customers. Nine models, including SUVs, MPVs, sedans and new energy vehicles, were displayed at the auto show, which was held on April 4-7. The exhibits showed of GAC Motor's manufacturing power. From left: GAC Motor signs letters of intent with local dealers during the news conference. Yu Jun, president of GAC Motor, introduces the company's products and plans during the news conference. VIP guests, including Commercial Consul Luo Xin and Consul Lou Jiahong of the Consulate General of the People's Republic of China in St. Petersburg, attended GAC Motor's news conference. They and other officials spoke positively about the carmaker. "We noticed that the Russian auto market has maintained double-digit growth in the past two years, which speaks volumes for the potential of the market. This is the reason why we came here, to deliver more products and provide more mobility choices," said Yu Jun, president of GAC Motor. GAC Motor has pushed ahead with plans to enter the Russian market since it announced the decision at last year's Moscow International Automobile Salon. So far, GAC Motor RUS has begun building sales outlets and is preparing for the cars' introduction. The company plans to launch three models in Russia. All of the models are expected to gain popularity and meet different customer groups' demands. One model is their flagship seven-seat SUV, the GS8. It is equipped with different driving modes, an intelligent safety system and all-wheel drive. The GS8 will enter the market this year, according to GAC Motor. The company said two other models - an MPV, the GM8 and another SUV, the GS5, with unique features, will cater to different customers' needs. Russian authorities are carrying out certification assessment of the models, according to the carmaker. 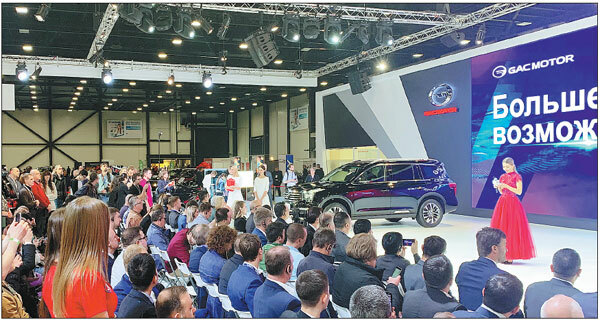 At the auto show, the styling, comfortable driving and cutting-edge technologies of GAC Motor's vehicles attracted the Russian media, dealers and customers. Eight Russian dealers have signed letters of intent with the company. As an emerging economy, Russia plays an important role in the Belt and Road Initiative. It is also one of the most significant overseas markets of GAC Motor. This year, GAC Motor Russia will further promote its localization and enrich its product lineup. They aim to increase their sales volume and serve customers in surrounding countries as well, Yu said. Since its establishment, GAC Motor has adopted a path that is "high-end-focused, quality-first, and innovation-driven". Its sales jumped from 17,000 units in 2011 to 530,000 units last year, according to the company. With the goal of building a world-class brand and a global company, GAC Motor has focused on emerging countries to expand their markets and gradually covered major auto markets in the world. In recent years, the carmaker has been making efforts to push forward its internationalization strategy and build a global research and development network. It consists of the Silicon Valley R&D Center, Los Angeles Advanced Design Center and Detroit R&D Center in the United States, among others. Last year, it participated in big international auto shows in Detroit in the US, Paris and Moscow to showcase its determination to go abroad. Before the auto show, leaders of Guangdong province - where the automaker is based - inspected the site of GAC Motor RUS in the Greenwood Business Park, Moscow, and participated in the unveiling ceremony. GAC Motor will also participate in the Russian Association of Auto Dealers' annual meeting to be held in Moscow on Wednesday and Thursday and launch promotional events to further develop its dealerships in Russia.